The Today show played a dangerous game this morning, floating the notion that President Bush manipulated the release of an OBL tape in 2004 to influence the outcome of the presidential election. Today opened the segment by flashing the image to the right, which so closely juxtaposed photos of W and OBL you might have thought it was a campaign poster. And call me suspicious, but I can't help but wonder if the "Close Up" beneath the photos wasn't merely the title of the lead segment but also Today's 'subliminable' comment on the pair's relationship. 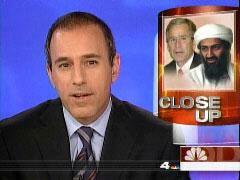 Just in case anyone missed the point, Lauer archly asked: "is OBL President Bush's not-so-secret weapon?" Lauer then suggested the WH is exploiting the latest OBL tape to conduct a "PR blitz" in support of the NSA surveillance program. Lauer then handed the ball to NBC reporter David Gregory, who claimed that the White House has "politically seized" the moment "with the OBL tape still fresh" to "step up its campaign against its critics" on the surveillance issue. "The Bin Laden effect has been felt before. A week before election day in 2004, another tape, more threats." Today then rolled a clip of John Kerry speaking in 2005 with Tim Russert on Meet the Press. Kerry suggested that the release of an OBL tape shortly before the 2004 election cost him the White House: "We were rising in the polls up until the last day when the tape appeared. We flatlined when the tape appeared, went down on Monday." Gregory immediately followed Kerry's complaint with this statement of his own: "Now the administration is using this OBL tape to defend homeland security measures." So if the administration "now" is "using" "this" OBL tape, how was the administration "using" the OBL tape then, in 2004? Gregory didn't tell us, but the implication was in the air that President Bush arranged for the release of the tape in 2004 to help himself get elected. The Today show has dramatically raised the stakes. It has floated the grave notion that the White House withheld vital national security information to serve its electoral interests, and/or that the President of the United States and the world's leading terrorist are somehow in collusion. It is time for Today to put up, or not merely shut up but admit that it has engaged in the worst kind of unpatriotic undermining of our nation's interests.